(ii) where a Military Nursing Service Officer is under suspension on the 1 st day of January, 2016, the option may be exercised within one hundred and eighty days of the date of his return to his duty, if that date is later than the date prescribed in this sub-rule. Note 2 – Military Nursing Service Officers who have died on or after the 1 stday of January, 2016 and could not exercise the option within the prescribed time limit, are deemed to have opted for the revised pay structure on and from the 1st day of January, 2016 or such later date is beneficial to their dependents, if the revised pay structure is more favourable and in such cases, necessary action for payment of arrears shall be taken by the Principal Controller of Defence Accounts(Officers). 10. Date of increment in revised pay structure. – (1) There shall be two date10. 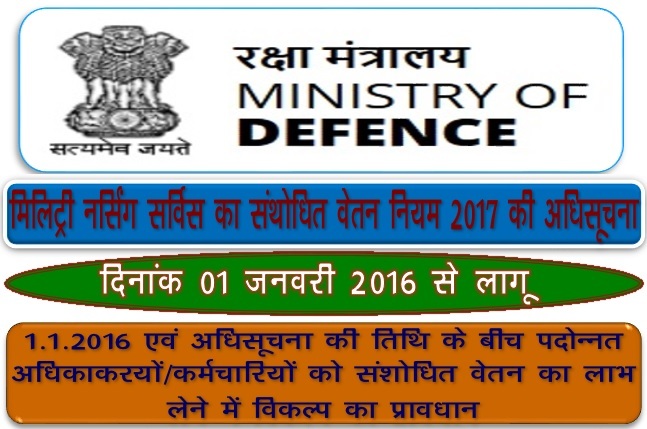 Date of increment in revised pay structure.- (1) There shall be two datefor grant of annual increment namely, 1st January and 1st July of every year, instead of existing date of 1st July, provided that an Officer shall be entitled to only one annual increment, either on 1st January or 1st July depending on the date of his appointment or promotion or upgradation. 11. 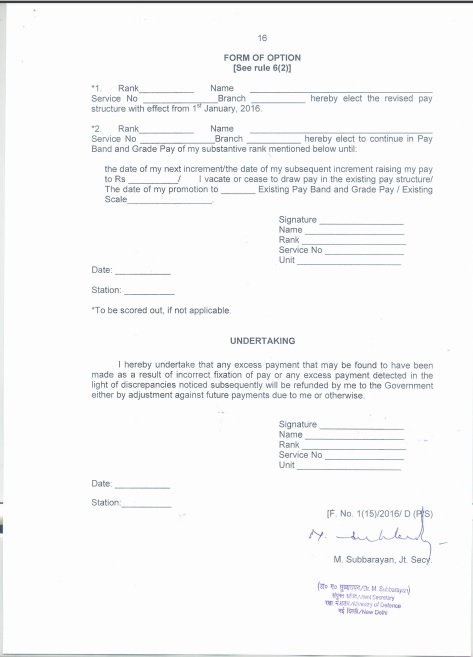 Revision of pay from a date subsequent to the 1st day of January, 2016. – Where an Officer who continues to draw his pay in the existing pay structure is brought over to the revised pay structure from a date later than the 1st day of January, 2016, his pay from the later date in the revised pay structure shall be fixed in the manner prescribed in accordance with rule 7. 13. Pay of Officers commissioned with Ante Date for Pay on or after 1st day of January, 2016. 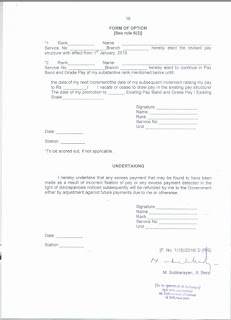 – Pay of Officers commissioned with ante date for Pay on or after 1st day of January, 2016 shall be fixed notionally from the date of ante date in the relevant revised Level or pre revised scale as applicable and the pay shall then be arrived at as on date of commission after adding increments at the applicable rates for the period of ante date. 14. Mode of payment of arrears of Pay. – (1) The arrears, computed after deduction of subscription at enhanced rate of Defence Services Officers provident Fund with reference to the revised pay, shall be paid after deduction of adhoc arrears paid as per Government of India MoD letter No. 1(11)/2016/D(Pay/Services), dated 10th October, 2016. 17. Interpretation .- If any question arises relating to the interpretation of any of the provisions of these rules, it shall be referred to the Central Government for decision.